According to a recent study done by the site Pingdom, women participate more than men in most social networking sites. The outliers? Slashdot, Reddit, and Digg – which does not surprise me at all, based on the content that is prevalent on those three sites. 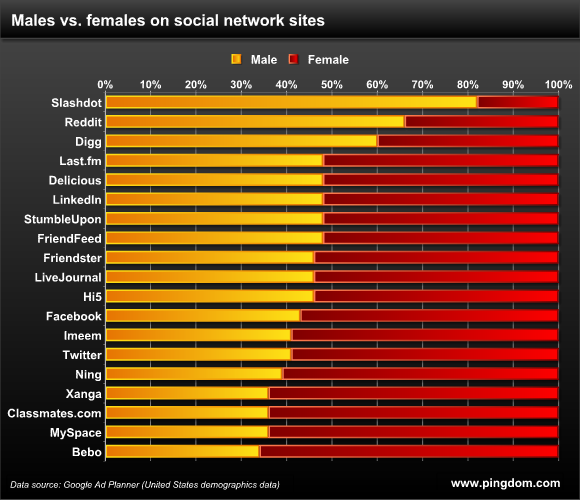 Pingdom has a nice graphic (below) showing the gender distribution across the Social Web. For the full blog post for this report, continue reading here. The Internet: Past, Present & Future How Much Content Do You Consume?